Tag Archive | "West African lungfish"
The West African lungfish (Protopterus annectens) is the most commonly seen species in the tropical fish keeping hobby. It is found in the partially dry floodplains, marshes, slow moving backwaters and the swamps of Guinea, Togo, Sierra Leone, Cameroon, Niger, Ivory Coast, Nigeria, Burkina, Faso, Gambia, Ghana, Chad, Benin, Senegal, Kenya, Mali, Sudan and the Central African Republic. It is obviously widespread throughout West Africa, hence it’s common name. West African lungfish have rudimentary gills that allow them to breathe underwater and a set of paired lungs that allow them to periodically rise to the surface to gulp in atmospheric air. Their “lungs” are actually a modified swim bladder that is similar to those of primitive amphibians. Like most lungfish, the West African Lungfish has developed four long, thin, fleshy limb like structures that they use to crawl around in the mud and when necessary, over land. They posses tooth enamel, have a four chambered heart that allows a separation between pulmonary and body blood flow, and can slow their metabolic rate into a state of aestivation where it can remain for several years. As the waters subside during the African dry season, the West African Lungfish will look for a “nesting” site, usually around vegetation and dig a tunnel (usually about 12″ deep)into the muddy substrate. They burrow themselves into the tunnel and wriggle around until they form a bulb like chamber, where they will spend the dry season. They position themselves with their head towards the opening and secrete a mucous around themselves that hardens into a “cocoon” and protects the fish. At this point their metabolism slows down to a halt and they remain motionless until the rainy season returns. This entire process is known as aestivation. Because of it’s availability and more manageable size, Protopterus annectens is the most commonly seen lungfish in the aquarium hobby. It is the most available, extremely hardy, and relatively easy to keep compared to the other species however, it is still only recommended to intermediate and more experienced tropical fish keeping enthusiasts. Their crushing teeth can cause a nasty bite and they should be handled with extreme care. Feed them with tongs, not your hand. Juvenile West African Lungfish can initially be kept in smaller tanks, but they will quickly outgrow them. An aquarium of at least 60 gallons is recommended with a mud, sandy, or extremely fine gravel substrate. They are lethargic and do not move around much, but they still need room to turn around. They are not picky about their surroundings but water movement should be kept to a minimum. Most tropical fish keeping enthusiasts provide some aquatic vegetation along with driftwood or bogwood roots for them to hide among, and they do prefer dim lighting conditions. A cover should be placed on their tank with enough of a space for them to gulp fresh air as needed. All lungfish are messy eaters and although they can tolerate a wide range of adverse water conditions, a canister filter should be used to keep their tank clean and prevent disease. Because of their soft skin, avoid placing any sharp decorations into their tank. All lungfish are best kept in a single species aquarium. Some hobbyists try to keep them in a community tank with other large species, but they are unpredictable and can suddenly turn on their tankmates. This species is also intolerant of other lungfish in their proximity. 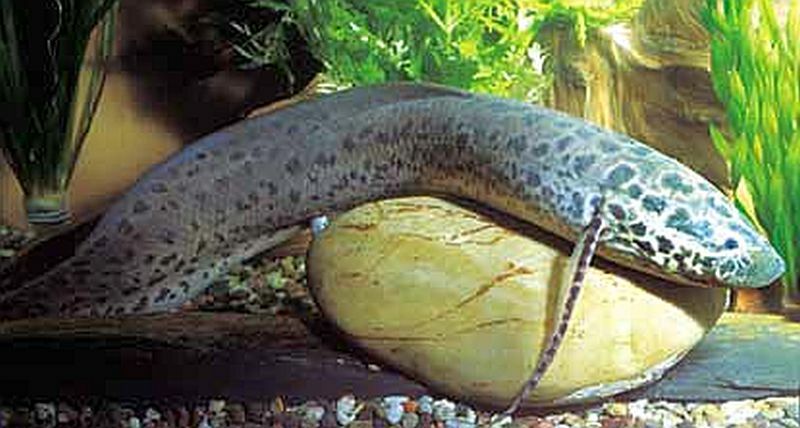 Spawning the West African Lungfish has not yet been achieved in captivity. In the wild, they construct a nest in the mud and line it with vegetable matter. After the eggs are deposited into the nest by the female and fertilized by the male, the male will guard the eggs until they hatch and the little tadpole like fry lose their “Newt like” gills. Their spawning behavior is basically the same as the Marbled Lungfish (Protopterus aethiopicus). Protopterus annectens are omnivorous and in their native habitat prey on fish, shellfish, amphibians, and various types of plant matter. In an aquarium environment, they should be fed a variety of live or fresh dead foods including shrimp, prawns, mussels, pieces of fish, algae wafers and other vegetable matter. Adults should be fed whole fish or chunks of fresh fish and shrimp. Juvenile Lungfish should be fed twice a day, but as they mature they only need to be fed a couple of times a week. In the wild they can go without food for months, to years. 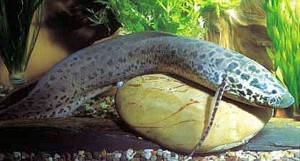 West African Lungfish are relatively common but are still considered a “specialty” item. They are available online as juveniles at reasonable prices, but be prepared to make a commitment to keeping one of these fish for a long time. They routinely live for 20 years or more.